Something wild is stalking through London and only one man can stop the killings. London is a city drowning in fear as a barrage of gruesome murders plague the streets in Whitechapel. 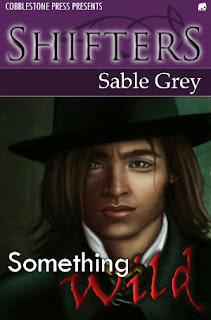 Detective Baden Sikes is out to find the ripper but gets preoccupied a bit with a young woman he decides to save from a life of thievery in the streets. Baden wants Cora...wants her bad, but with so much at stake and his own secrets threatening to destroy him and those he loves, can he afford to give his heart to this woman? Or will he leave them all at the mercy of the wild thing that stalks through London? Baden stood in the doorway of the kitchen, sipping his bourbon as he watched Cora make her tea. It was past midnight. He’d heard her weeping earlier, but waited until her sobs had ceased. Now his gaze slid down the length of her blonde hair to the sleeping gown. It was the same she’d worn when she’d attempted to seduce him with her ripped slipper. Its sheer material slipped around her curves as she moved, and each time she stepped in front of the candle, he could see the outline of her body. He leaned against the doorframe when she began humming softly. “Have you enough for two?” he spoke then smiled when she started with a yelp of surprise. Her fingers splayed out against her chest as she breathed out. She turned back to her tea after a quick glance at his glass. “I’ve more than enough, if you want some.” She nodded and reached for a second cup. He just wanted to be near her. To smell her scent, to have her look at him with those clear eyes, to scold him with her quick tongue. Everything about her excited him, aroused him. He didn’t want tea. He wanted her. “But you went back. Did he not give you more advice?” Baden walked slowly toward her, but she didn’t turn to face him. “It was suggested I use my mouth to seduce you.” Her hands dropped to the wooden surface of the counter. “I’d not resolved if I would or would not.” She visibly shook, obviously affected by him. Carefully he set his glass on the counter behind her, slanting his gaze down at her when she closed her eyes and breathed in deeply as if she were breathing in his scent, too. “And it does not occur to you to respect my wishes?” He raised an eyebrow. “I told you that if I indulged myself, I would keep you.” He wanted to touch her, to reach out and run his finger across the softness of her cheek. “And what are you?” she asked, her words breathy as if she continued to be affected by him. “Something wild.” He finally lifted a finger to brush back a strand of her hair. “Not much different than The Ripper…” Her fingers suddenly pressed against his lips; her large blue eyes welled with sudden tears. “If you only knew, you would not be so eager to win my affection,” Baden spoke against her fingers. “I am only half a man.” Baden reached up to wrap his hand around her delicate wrist, pulling her fingers from his mouth. “The rest is…” He stopped when her fingers curled against him. Her gaze reflected deep lust. She would not care if he told her he was half winged demon. Her desire warmed him more than any bourbon, intoxicated him. He leaned forward, brushing his jaw against her cheek as he inhaled deeply, exhaling on the word “beast”. He might have leaned away. He might have left the room. But that small whimper that pushed from her lips weakened and bound him. So be it.